Today is the day that Malaysia decides. Unlike states like Penang or Kelantan, it's pretty obvious which party dominates the electoral campaign in my hometown, Kuantan, Pahang. The situation here are completely different than what I've read about other 'hot states' as the people here seems to show undivided support for Barisan Nasional. 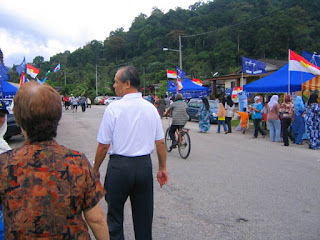 Mom, Dad and I walking towards SK Semambu passing by BN camp. 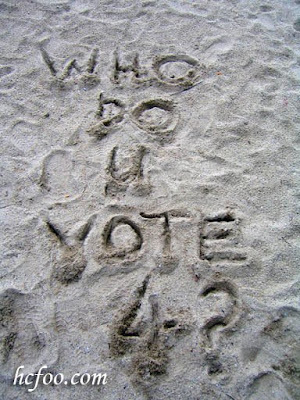 My family and I decided to go out early to cast our votes. The five of us went to different schools. The time taken to cast our votes were pretty fast. We spent only about 5 minutes, almost doesn't need to queue up. Quite a number of people already lining up according to their lining stream. I'm glad I'm not on this stream. I'm next in line to exercise my rights. 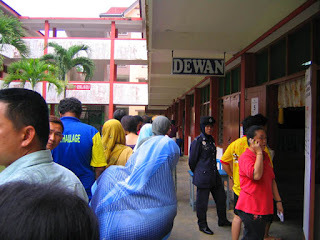 My polling station at SK Semambu was pretty happening as there was a huge turnout when I arrived. Even Pang Tsu Ming was there greeting voters. His popularity is huge here gaining support from Malay and Chinese voters and volunteers. PKR and PAS remained very quite (just a few of them) in the background. 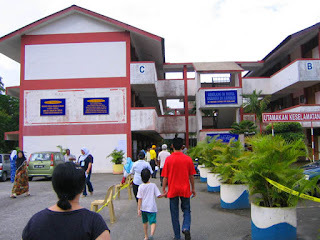 DAP is completely invisible in Kuantan, not even a single bunting or poster. Coming back to hometown to cast my vote here makes me humble especially seeing my mother meeting many of her Malay customers here who are BN volunteers and supporters. For your information, my mother used to run a saloon in Jalan Mahkota for more than 40 years. 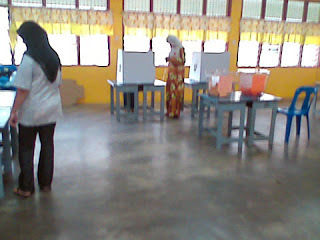 This is the first time casting my vote and it was a great experience. I have only one hope. The future government will GET what majority rakyat wants.